In the Dark Ages after the Romans abandon Britain, the Saxon threat is growing stronger every year. 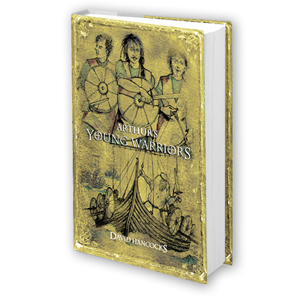 For sixteen-year-old Rhys, whose father was killed by a Saxon raid, this means he must leave his family and home at his grandfather’s estate to go to the monastery school of Caerllion and study under the tutelage of the harsh Abbot Aidan. But Rhys’ real ambition is to become a warrior and avenge his father. So he is overjoyed when – despite the protests of Abbot Aidan – he is given the chance to train under the command of Prince Arthur himself, the greatest warrior ever to protect Britain. Rhys works hard to prove himself both to Arthur and to his fellow Colts, but is always eager to go home to visit his family – and Helena, the daughter of his grandfather’s steward, Rhys’s first love. When Helena is kidnapped, Rhys will stop at nothing to rescue her. With the help of his friends, Rhys must find out whether he has the courage to fight for his country, avenge his father – and earn the love of Helena. Packed with action, intrigue and romance, this is an exciting tale of friendship, courage and first love.